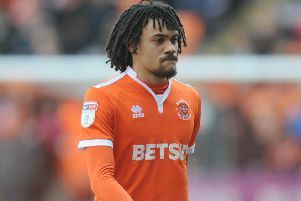 Gary Bowyer says he withdrew a “mentally drained” Curtis Tilt from Blackpool’s squad for the opening day of the season for the good of the team. The defender travelled with the squad to Wycombe Wanderers for Saturday’s 0-0 draw but Bowyer opted not to name him in his squad of 18 amid ongoing speculation over his future. The 27-year-old, who celebrated his birthday on the day of the game, is still being heavily linked to Ipswich Town. However, in a surprise twist, it appears Owen Oyston is reluctant to lose the club’s prized asset. “He trained well last week but it’s human nature, isn’t it?” Bowyer said when asked why left Tilt out of the squad. “It takes a lot out of you mentally when you’re being linked constantly. “There’s been negotiations toing and froing from what I understand, and I just thought he looked a little bit mentally drained with it all. “You can’t be doing that going into this game. When asked if he expects Tilt to depart, Bowyer replied: “It’s not up to me I’m afraid. “The lad wants to play at a higher level, who can deny him? “Well I know who can deny him, of course. “But I can’t blame his ambition or bemoan him or anything like that. The deadline for permanent signings closes at 5pm on Thursday to coincide with the new Premier League season, which begins next weekend. Bowyer spoke of his frustration at the timing of the deadline, referencing similarities to the situation at Shrewsbury Town where Jon Nolan and Toto Nsiala have also handed in transfer requests – just as Tilt did last week. “The window closes next week before the season starts for the Premier League but we have to suffer and go through that,” he added. “If it was last Thursday or August 1, everybody in the country knows the business has been done so you have a week to prepare. “It’s not fair on the clubs. Shrewsbury are in a similar situation. We all are. “At Wycombe we’ve put a defensive pairing together who have trained together for two days. “I can’t wait for next Thursday so everybody knows where they are for five or six months. “Everybody is looking, we’re short on bodies. “Obviously we had Tilty missing, Nick Anderton was the only other one who was fit and available. “We’ve got Ryan McLaughlin, Rowan Roache and Jimmy Ryan out with injuries.